PM serramenti offers different kind of entrance doors thanks to the careful study of shapes and opening types, materials and colours. The R&D office identifies the most innovative materials such as leather, glass, steel, cement combined with the traditional structural element, wood. Thank to the collaboration with designer and companies of this sector, PM serramenti doesn’t offer only simple entrance doors, but element that empazises the concept of “entrance architecture”. Every project is custom-made and wisely integrated with other elements we realize (windows, complements of furnish). 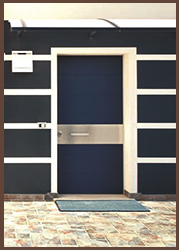 The range of product lines currently includes a variety of solutions that offer a supporting structure in wood or with a metallic cover (armored door). 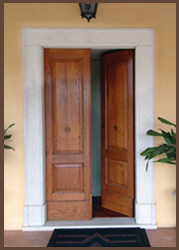 Wooden entrances are particularly recommended in cases in which the doorway size is very wide and therefore needs a combination of blind and glass parts; armored doors, on the other hand, are more easily applied when the size is contained or close to those of standard constructions. Wooden entrances are custom-made, using wood that was specifically selected for its resistance and its esthetic characteristics. 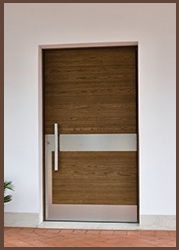 Entry doors with a high technical and esthetic value are exclusively custom-made, implementing wood that is specifically selected for its stability, resistance and esthetic worth. Security doors certified in burglary-proof classification, in accordance with regulation Uni En V 1627/28/29/30 (class 4, class3). This kind of product represents the perfect solution when the primary need is safety, but thermal and acoustic performances are notable as well. 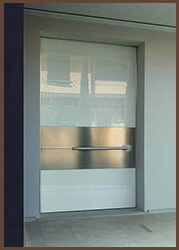 Security doors certified in burglary-proof classification, in accordance with regulation Uni En V 1627/28/29/30 (class 4, class3) that have a vertical tilting coplanar to the wall and are therefore particularly suitable for large dimensions.